Connie Prince Digital Scrapbooking News: Cyber Monday winner, sales and a freebie! Cyber Monday winner, sales and a freebie! Have you stocked up on Connie's awesome kits yet? There's still time to shop! First lets congratulate Karen PG! You won last week's blog game! Connie will be sending you a coupon shortly! Come back on Wednesday for another chance to win a coupon to Connie's store! It's a blast to play! There's a few days left in Connie's Black Friday Sale! Stock up at Gingerscraps, The Digichick and Digital Scrapbooking Studio! Spend $10 and get a kit of your choice! Don't miss picking up the Black Friday Grab Bags! First you have North Pole! Grab at Gingerscraps, The Digichick and Digital Scrapbooking Studio. And Connie has a Template Grab Bag! Get at Gingerscraps, The Digichick and Digital Scrapbooking Studio. 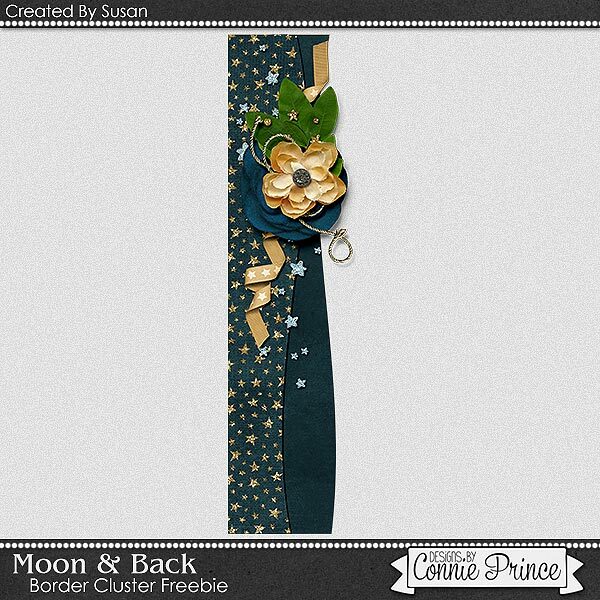 Susan made you this border cluster freebie using Moon and Back!